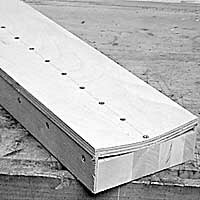 Long radius-sanding blocks for finish-sanding fingerboard surfaces are a great help. Necks with cylindrical fretboard are moved over these blocks, which are fastened on the workbench in a lying position. As I am unfortunately not aware of any source of such (long) radius-sanding blocks, you will have to make them yourself. The one I am going to describe gets its radius from three pieces of bent 3mm (1/8")- thick plywood. With plywood thicker than that you won't get an even curve. The base block can be built from five boards. The necessary height (h) of the two side boards can be calculated for any radius with the formula below. Spread glue between the plywood sheets and screw them down along the center line.